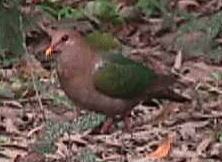 In Australia the Emerald Dove is a common resident of rainforests and adjacent dense vegetation. It is most numerous where the forest or similar dense cover is fragmented. Often it is observed flying swiftly and low over open ground between foraging areas. It forages on the forest floor alone or in pairs. The nests of many pigeons and doves seem to consist of not much more than a beakful of twigs and a prayer. It is surprising that they hold eggs, let alone wriggling nestlings. It walks away when approached and only takes flight when hard pressed. The territorial call is a low, repeated cooing. It is observed readily at Chambers Wildlife Rainforest Lodge , and elsewhere along walking tracks and in picnic areas. Also know as the Green Pigeon, this beautiful dove is generally coloured an almost purple-brown with bright green wings and a red bill. Their call is often heard while one is walking around the forest, but the bird itself may not be seen, for it may calling from a nest or a perch in the canopy. They are also occasionally found in a few different habitats, and do quite well on the rainforest edge, where they can feed off invasive non natives. In some situations they can become very tame; the bird may be found wandering about people’s feet in cafes located in the forest. Like many other pigeons they have a persistent courtship ritual which involves the male giving deep bows and lifting his tail and cooing loudly. Both sexes look after the eggs, the female at night, the male during the day, with the shift changes occurring in the afternoon and morning (Schodde and Tidemann 1990). They are not agile canopy climbers like many other tropical forest pigeons, and are usually found walking along the ground. When disturbed they may fly up and into the canopy to perch, their green blending in well with the surrounding foliage. On the ground and on the edge of the forest they feed mainly on fallen fruit. These fruits include natives such as figs, but may also include invasive plants and foreign weeds, such as raspberry, tobacco and lantana. They are found in northern and eastern Australia, and then on through New Guinea, into tropical Asia through to India. Locally, it is often seen flying up from the side of the Cape Tribulation road and the Bloomfield track. They have become habituated to people in the caf� and restaurant area on Fitzroy Island.